Here’s a small sample of just a few of many websites we have created and the impact they have had on their businesses. 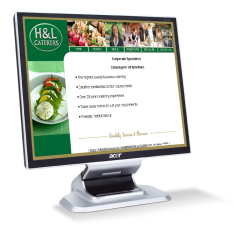 HL Caterers needed a website that could be easily updated and allow customers to see their updated menus on a regular basis. An administrators area was created on the website so that the client can easily update and amend their menus on a regular basis. Printland are a creative design based company based in the West Midlands, who specialise in print and marketing. Their work includes complete exhibition stand graphics, point-of-sale displays for shops, hard bound books web sites, logo design and printed publications, they needed a simple website to showcase the company and promote the services they offer. Goalden Events needed a web presence in order to promote their services to corporate companies. The site consists of a photo gallery, video footage, games and company information. 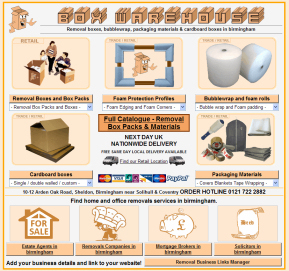 Box Warehouse went from being a local business to becoming a national distributor of Cardboard Boxes, Moving Kits and packaging after the website was completely redesigned, incorporating a dynamic products database, bespoke shopping cart and secure online credit card order area. The Website has been fully optimised and appears VERY highly on Google generating business that dwarfs the outlay made on creating their web presence. Blythewood wanted to promote their guesthouse online to local visitors who use the local Birmingham airport and attend exhibitions at the NEC. oasis are a long established family run group of companies. They needed a total makeover on their dull flat website. This was achieved with some eyecatching flas animation on the homepage, some bespoke 360 degree animated mini tours of their retail facility also incorporating their other companies Centaur and Celestial within the site.